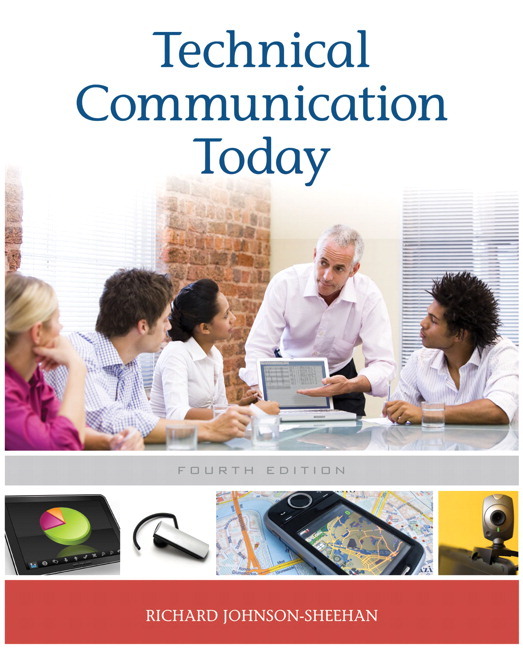 Technical Communication Today speaks to today's students and how they expect to learn information. Instructional narrative is “chunked,” so that readable portions of text are combined with graphics. This presentation facilitates learning, and models the way today’s technical documents should be designed. Additionally, the chunked presentation integrates an awareness of how documents are read–often “raided” by readers seeking the information they need. By mirroring these processes in its content and structure, Technical Communication Today offers readers a higher level of accessibility. Each chapter places an emphasis on the activity of producing effective documents by following a process approach that mirrors how professionals communicate in the technical workplace and how students learn in the classroom. An open design facilitates learning by presenting material graphically and in accessible chunks of information. The text incorporates the newest technology-driven changes in workplace communication with in-depth discussions of email, instant messaging, working in virtual teams, making Web sites, blogging, podcasting, incorporating digital audio and visuals in documents, using PDAs, and negotiating ethical situations in electronic communication among many other available strategies and tools. Diagrams that illustrate typical outlines of each genre open Chapters 5-11; these “Quickstarts” display basic elements of each major document type for visual learners and include specific, to-the-point guidance to get students writing. Annotated sample documents throughout show students worthwhile examples of workplace writing, usually on topics of intrinsic interest to a variety of student majors. Case studies at the end of each chapter present situations that students might encounter in the workplace and often involve an ethical dilemma. They are designed to demonstrate the personal, social, political, economic, and environmental issues that shape decisions in the technical workplace. Abundant exercises and projects at the end of each chapter give students opportunities to work individually or in teams and are designed to challenge students with realistic workplace writing assignments. “At Work” boxes in each chapter feature interviews with working professionals about how they communicate in a variety of workplace situations offering students a glimpse of the challenges faced in real world settings. “Help” boxes in every chapter describe how a specific computer application or related strategy can be used to improve the production and presentation of workplace communication. “At a Glance” information boxes serve as study aids and self-check reviews of major topic discussions for the “raiding” reader. “Take Note” call-outs supplement the main text with tips for understanding concepts and are quick asides to readers who desire more information on a subject. An extensive Instructor's Manual offers teaching strategies for each chapter. It will be available online and offer additional material for downloading such as slides and Power Point lectures as well as additional suggestions for assignments and projects. The E-Text within MyTechCommLab increases flexibility for students who prefer studying online. Book-specific quizzes that correlate to learning objectives are available in the new MyWritingLab for technical communication. Writing prompts from the text also appear in the MyLab and can be composed and evaluated there. 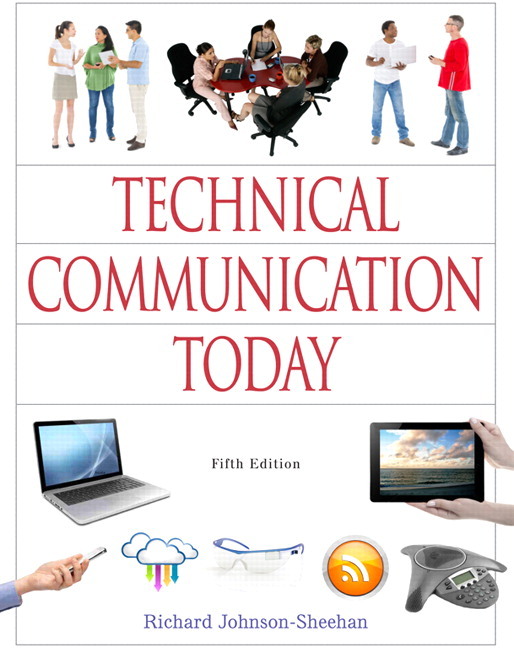 How Important is Technical Communication? When Is It Appropriate to Use Passive Voice? Richard Johnson-Sheehan is a Professor of Rhetoric and Composition at Purdue University. At Purdue, he directed the Introductory Composition program, and he mentored new teachers of composition for many years. He teaches a variety of courses in composition, professional writing, and writing program administration, as well as classical rhetoric and the rhetoric of science. He has published widely in these areas. His prior books on writing include Technical Communication Today , now in its fifth edition, and Writing Proposals , now in its second edition. Professor Johnson-Sheehan was awarded 2008 Fellow of the Association of Teachers of Technical Writing and has been an officer in the Council for Writing Program Administrators.